The AgustaWestland AW101 (EH101 before June 2007) is a medium-lift helicopter for military applications but also marketed for civil use. The helicopter was developed as a joint venture between Westland Aircraft in the UK and Agusta in Italy (now merged as AgustaWestland). The aircraft is manufactured at the AgustaWestland factories in Yeovil, England and Vergiate in Italy. The orginal designation, "EH101", is a typographical error that stuck: the aircraft was originally designated EHI (European Helicopter Industries) - 01. The first Italian Navy production helicopter (MM81480) was first flown on 4 October 1999 and was officially presented to the Press on 6 December 1999 at the Agusta factory. Deliveries to the Italian Navy started at the beginning of 2001 and were completed by 2006. Italian EH101s operate from major surface units, aircraft carriers and amphibious assault ships. In 2001, the Royal Danish Air Force announced the purchase of eight EH101s for SAR duties and six tactical troop transports. 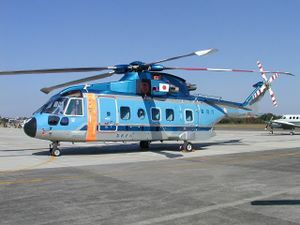 The last of the 14 EH101s was delivered March 1st 2007 and the first SAR EH101s became operational in late April 2007. The Danish Mk 512s have a MTOW of 15,600 kg. In 2007 the British Ministry of Defence acquired the six troop transport Merlins to alleviate a shortfall in British operational helicopters. In exchange the British have ordered six new-build helicopters from AgustaWestland as replacements for the Royal Danish Air Force. On January 28 2008 one Danish EH101 broke the drive shaft from one engine to the gear box and made an emergency landing at Billund Airport. Following this incident the Danish fleet was grounded as a security precaution. The incident caused some national debate about the future of the EH101 programmed in Denmark and whether it made sense to acquire different helicopters since the EH101 had very low availability (roughly 30%) due to mechanical issues. AgustaWestland, in turn, blamed the Danes for ordering spare parts very late and not keeping enough staff to properly service the helicopters. The Portuguese Air Force has operated EH101s since 24 February, 2005, in transport, search and rescue (SAR), combat search and rescue (CSAR), fisheries surveillance (SIFICAP) and maritime surveillance missions. The 12 aircraft, in three versions, gradually replaced the Aérospatiale Puma in those roles. Only Portuguese Merlins are painted in a tactical green and brown camouflage. The main role of the Portuguese EH101 is search and rescue in Portugal's expansive maritime zone. EH-101s are on constant alert at three bases: Montijo (near Lisbon, Portugal), Lajes (Azores) and Porto Santo (Madeira). The Japan Maritime Self-Defense Force ordered 14 aircraft in 2003 to use in both the MCM (Mine Clearing Mission) and transport roles. The MCH-101 will replace the S-80-M-1 (MH-53E) for MCM, and the Sikorsky S-61 in a support role for Japanese Antarctic observations. In November 2007, Algeria signed a contract for six AW101 helicopters. The first aircraft will be delivered in 2009, with further orders possible. Tokyo Metropolitan Police Department became the first civil customer for the type when they purchased a single example in 1998. Five Merlins have been written-off and one damaged in accidents, of which three have been due to problems with the tail rotor hub cracking. 21 January 1993 - Italian development Merlin PP2 (MMX600) crashed near Novara-Cameri airfield in Italy after an uncommanded application of the rotor brake in flight - four killed. 20 August 1996 - Italian development Merlin PP7 (I-HIOI) was damaged in an accident when it turned over after the tail rotor drive failed on landing. The helicopter was repaired. 15 November 2007 - During a medical evacuation in the island of São Jorge, Açores, Portugal, a Portuguese Air Force Merlin caused injuries to five people when it suddenly and unexpectedly climbed by one meter in the middle of the embarking procedures. The pilot was then able to recover the control of the helicopter minimizing the damages. According to the air force spokesperson, this kind of incident is unheard of. This page was last edited on 21 February 2008, at 09:19.